This slightly laundered remake of the 1932 courtroom classic The Mouthpiece stars George Brent as brilliant but unprincipled DA Steve Forbes, a character based on legendary lawyer William Fallon. After railroading an innocent boy into the electric chair, Forbes goes on a bender, then cynically builds up a new practice as a criminal attorney. His underhanded legal tactics cause a rift between Forbes and his idealistic younger brother Johnny (William Lundigan), despite the fact that it was Steve's income that enabled Johnny to finish law school. Angered that his brother has enabled big-time gangster J.B. Roscoe (Richard Barthelmess) to continually elude the law, Johnny turns in damning evidence to the FBI. On Roscoe's orders, Steve frames Johnny on a murder charge, but reforms his ways in the nick of time. 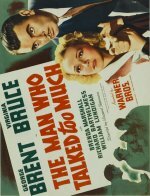 Based on a play by Frank J. Collins, The Man Who Talked too Much was remade in 1955 as Illegal, with Edward G. Robinson in the lead.